Forensic science laboratories' reputations have increasingly come under fire. Incidents of tainted evidence, false reports, allegations of negligence, scientifically flawed testimony, or - worse yet - perjury in in-court testimony, have all served to cast a shadow over the forensic sciences. Instances of each are just a few of the quality-related charges made in the last few years. Forensic Science Under Siege is the first book to integrate and explain these problematic trends in forensic science. The issues are timely, and are approached from an investigatory, yet scholarly and research-driven, perspective. Leading experts are consulted and interviewed, including directors of highly visible forensic laboratories, as well as medical examiners and coroners who are commandeering the discussions related to these issues. Interviewees include Henry Lee, Richard Saferstein, Cyril Wecht, and many others. The ultimate consequences of all these pressures, as well as the future of forensic science, has yet to be determined. 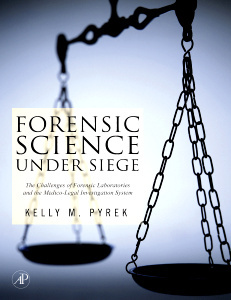 This book examines these challenges, while also exploring possible solutions (such as the formation of a forensic science consortium to address specific legislative issues). It is a must-read for all forensic scientists. Forensic DNA/genetic specialists, law enforcement and criminal investigators, crime scene technicians, private forensic consultants, general forensic community (trace experts, fingerprint, ballistics, etc. ), crime laboratory directors and technicians, medical examiners, coroners and forensic pathologists, forensic nurses, prosecutors, and law enforcement. Forensic science and criminal justice 4- and 2-year college students, high school students, forensic nurses, prosecutors, defense attorneys, district attorneys, members of the criminal justice system, and interested laypersons.